Using a large, deep saucepan, add peeled potatoes and enough cold water to cover completely. Boil the potatoes in water until soft (around 15 minutes). Once potatoes are cooked, drain them from the water and mash until super smooth. *Be careful not to over cook them, you don’t want them to be flooded and become super watery. Add parmesan, rosemary, chilli flakes, salt and cracked pepper to the potatoes and mix throughly. Leave this mixture to cool completely before moving to the next step. Once cooled, add the egg yolk, plain flour and mix (this is where you need to use your hands). Transfer mixture to a floured surface and continue to kneed until it has formed into a soft dough (you don’t want super sticky dough). Roll the dough into a circle, cut the circle into quarters. Using one quarter at a time, roll out into a sausage like figure. Cut the long roll into 2cm pieces. Using each little piece individually, roll into a small ball. Using a fork, press the fork into the gnocchi to give it that ridged look. This isn’t necessary, but it sure makes it look good. To cook the gnocchi, boil some water with a pinch of salt. 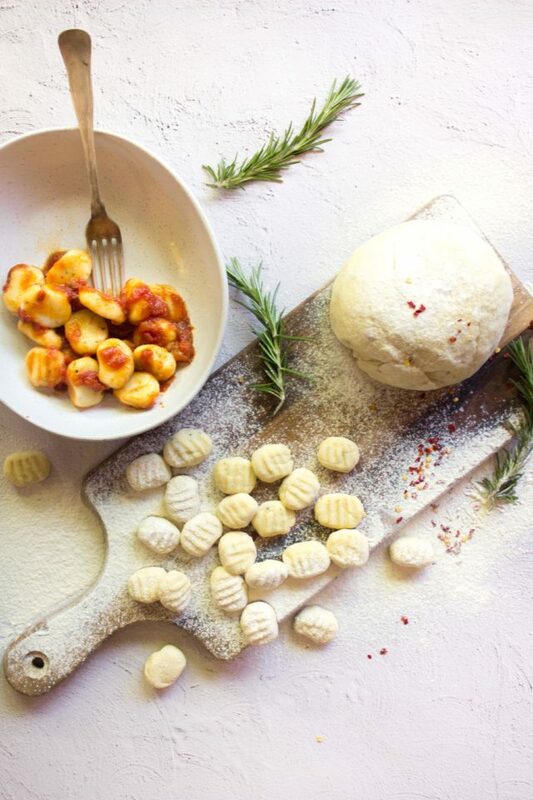 The gnocchi only needs to be cooked for 1 – 2 minutes. They should float to the top of the water once they are almost ready. Into a deep saucepan, heat olive oil over high heat. Add garlic, onion, chilli and leave to simmer until the onion is translucent. Place the crushed tomatoes and Passata sauce and mix through. Add oregano and a generous pinch of salt and pepper taste. Add basil leaves and simmer for 20 minutes or until thickened. Pair the sauce with the gnocchi and serve hot. These can be frozen for up to 4 weeks in an airtight container. Also a big thank you to Leah Itsines for this delicious recipe, we hope everyone enjoys!